^ 1.0 1.1 Martin P. S. Prehistoric overkill. (编) ed. P.S. Martin and H.E. Wright. Pleistocene extinctions: The search for a cause. New Haven: Yale Univ. Press. 1967. ISBN 0-300-00755-8. ^ Anderson, Paul K. Competition, Predation, and the Evolution and Extinction of Steller’s Sea Cow, Hydrodamalis Gigas. Marine Mammal Science (Society for Marine Mammalogy). July 1995, 11 (3): 391–4 [2008-11-02]. doi:10.1111/j.1748-7692.1995.tb00294.x. ^ Anthony D. Barnosky, Paul L. Koch, Robert S. Feranec, Scott L. Wing, Alan B. Shabel. Assessing the Causes of Late Pleistocene Extinctions on the Continents. Science. 2004, 306 (5693): 70–75. PMID 15459379. doi:10.1126/science.1101476. ^ Martin P. S. The last 10,000 years: A fossil pollen record of the American Southwest. Tucson, AZ: Univ. Ariz. Press. 1963. ISBN 0-8165-1759-2. ^ Martin P. S. Prehistoric overkill: A global model. (编) ed. P.S. Martin and R.G. Klein. Quaternary extinctions: A prehistoric revolution. Tucson, AZ: Univ. Arizona Press. 1989: 354–404. ISBN 0-8165-1100-4. ^ Martin, Paul S. Twilight of the Mammoths: Ice Age Extinctions and the Rewilding of America. 2005. ^ Flannery, T. The future eaters: an ecological history of the Australasian lands and people. NY: George Braziller. 1995. ISBN 0-8021-3943-4. ^ Diamond, J. Historic extinctions: a Rosetta stone for understanding prehistoric extinctions. (编) ed. P.S. Martin and R.G. Klein. Quaternary extinctions: A prehistoric revolution. Tucson, AZ: Univ. Arizona Press. 1984: 824–62. ISBN 0-8165-1100-4. ^ Diamond, J. Guns, germs, and steel; the fates of human societies. New York: Norton. 1997. ISBN 0-393-31755-2. ^ Mossiman, J. E., and Martin, P. S. Simulating Overkill by Paleoindians. American Scientist. 1975, 63: 304–13. ^ Whittington, S. L. & Dyke, B. Simulating overkill: experiment with the Mossiman and Martin model. (编) ed. P.S. Martin and R.G. Klein. Quaternary extinctions: A prehistoric revolution. Tucson, AZ: Univ. Arizona Press. 1984: 451–66. ISBN 0-8165-1100-4. ^ Alroy, J. A multispecies overkill simulation of the end-Pleistocene megafaunal mass extinction (PDF). Science. 2001, 292: 1893. doi:10.1126/science.1059342. ^ Nadasdy, Paul. Transcending the Debate over the Ecologically Noble Indian: Indigenous Peoples and Environmentalism. Duke University Press. 2006. ^ Svenson, Sally. Bison. South Dakota Department of Game, Fish and Parks. 1995. （原始内容存档于2008-09-13）. ^ May, R. M. Stability and complexity in model ecosystems. Princeton: Princeton Univ. Press. 2001. ISBN 0-691-08861-6. ^ Scott, J. Camel-butchering in Boulder, 13,000 years ago. Colorado Arts and Sciences Magazine. University of Colorado at Boulder. 2009-02-26 [2009-05-01]. （原始内容存档于2010-06-10）. ^ Willis, Paul; Bryce, Clay; Searle, Mike. Thylacoleo - The Beast of the Nullarbor. Catalyst. 2006-08-17 [2009-09-21]. ^ Andersen, S. T. The differential pollen productivity of trees and its significance for the interpretation of a pollen diagram from a forested region. (编) ed. Birks, H. J. B. and West, R. G. Quaternary plant ecology: the 14thsymposium of the British Ecological society, University of Cambridge, 28–30 March 1972. Oxford: Blackwell Scientific Pubs. 1973. ISBN 0-632-09120-7. ^ Ashworth, C.A. Environmental implications of a beetle assemblage from the Gervais formation (Early Wisconsinian? ), Minnesota. Quat. Res. 1980, 13: 200–12. doi:10.1016/0033-5894(80)90029-0. ^ 22.0 22.1 Birks, H. H. Modern macrofossil assemblages in lake sediments in Minnesota. (编) ed. H. J. B. Birks, and R. G. West. Quaternary plant ecology: the 14thsymposium of the British Ecological Society, University of Cambridge, 28–30 March 1972. Oxford: Blackwell Scientific Pubs. 1973. ISBN 0-632-09120-7. ^ 23.0 23.1 Birks, H. J. B. & Birks, H. H. Quaternary paleoecology. Baltimore: Univ. Park Press. 1980. ISBN 1-930665-56-3. ^ Bradley, R. S. Quaternary Paleoclimatology: Methods of Paleoclimatic Reconstruction. Winchester, MA: Allen & Unwin. 1985. ISBN 0-04-551068-7. ^ 25.0 25.1 Davis, M. B. Pleistocene biogeography of temperate deciduous forests. Geoscience and man: ecology of the Pleistocene, vol.13. Baton Rouge: School of Geoscience, Louisiana State Univ. 1976. ^ Vartanyan, S.L., Arslanov, K.A., Tertychnaya, T.V. & Chernov, S.B. Radiocarbon dating evidence for mammoths on Wrangel Island, Arctic Ocean, until 2000 BC. Radiocarbon. 1995, 37: 1–6. （原始内容存档于2009-12-13）. ^ Guthrie, R. D. Frozen Fauna of the Mammoth Steppe: The Story of Blue Babe. University Of Chicago Press. 1988. ISBN 0-226-31122-8. ^ Guthrie, R. D. Mosaics, allochemics, and nutrients: an ecological theory of Late Pleistocene megafaunal extinctions. (编) ed. P.S. Martin and R.G. Klein. Quaternary extinctions: A prehistoric revolution. Tucson, AZ: Univ. Arizona Press. 1989: 259–99. ISBN 0-8165-1100-4. ^ Bryson, R. A., Baerreis, D. A. & Wendland, W. M. The character of late-glacial and post-glacial climatic changes. (编) ed. W. Dort, Jr. and J. K. Jones, Jr., Dept. Geol., Univ. Kan. Spec. Pub. 3. Pleistocene and recent environments of the central Great Plains. Lawrence: Univ. Press Kan. 1970. ISBN 0-7006-0063-9. ^ Graham, R.W. & Lundelius, E.L. Coevolutionary disequilibrium and Pleistocene extinctions. (编) ed. P.S. Martin and R.G. Klein. Quaternary extinctions: A prehistoric revolution. Tucson, AZ: Univ. Arizona Press. 1989: 354–404. ISBN 0-8165-1100-4. ^ King, J. E. and Saunders, J. J. Environmental insularity and the extinction of the American mastodont. (编) ed. P.S. Martin and R.G. Klein. Quaternary extinctions: A prehistoric revolution. Tucson, AZ: Univ. Arizona Press. 1989: 354–404. ISBN 0-8165-1100-4. 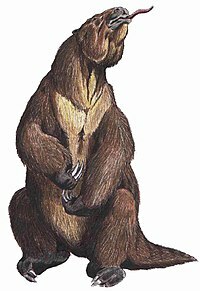 ^ Axelrod, D. I. Quaternary extinctions of large mammals. University of California Publications in Geological Sciences. 1967, 74: 1–42. ASIN B0006BX8LG. ^ Slaughter, B. H. Animal ranges as a clue to late-Pleistocene extinction. (编) ed. P.S. Martin and H.E. Wright. Pleistocene extinctions: The search for a cause. New Haven: Yale Univ. Press. 1967. ISBN 0-300-00755-8. ^ Kilti, R. A. Seasonality, gestation time, and large mammal extinctions. (编) ed. P.S. Martin and R.G. Klein. Quaternary extinctions: A prehistoric revolution. Tucson, AZ: Univ. Arizona Press. 1988: 354–404. ISBN 0-8165-1100-4. ^ Flereov, C. C. On the origin of the mammalian fauna of Canada. (编) ed. D.M. Hopkins. The Bering Land Bridge. Palo Alto: Stanford Univ. Press. 1967: 271–80. ISBN 0-8047-0272-1. ^ Frenzel, B. The Pleistocene vegetation of northern Eurasia. Science. 1968, 161: 637–49. doi:10.1126/science.161.3842.637. ^ 38.0 38.1 McDonald, J. The reordered North American selection regime and late Quaternary megafaunal extinctions. (编) ed. P.S. Martin and R.G. Klein. Quaternary extinctions: A prehistoric revolution. Tucson, AZ: Univ. Arizona Press. 1989: 354–404. ISBN 0-8165-1100-4. ^ Birks, H. J. B. and West, R. G. Quaternary plant ecology: the 14th symposium of the British Ecological society, University of Cambridge, 28–30 March 1972. Oxford: Blackwell Scientific Pubs. 1973. ISBN 0-632-09120-7. ^ McDonald, J. North American Bison: Their classification and evolution.. Berkeley: Univ. Calif. Press. 1981. ISBN 0-520-04002-3. ^ Burney, D. A. Recent animal extinctions: recipes for disaster. American Scientist. 1993, 81 (6): 530–41. ^ Vartanyan, S.L., Garutt, V. E. and Sher, A.V. Holocene dwarf mammoths from Wangel Island in the Siberian Arctic. Nature. 1993, 362: 337–40. doi:10.1038/362337a0. ^ Pennycuick, C.J. Energy costs of locomotion and the concept of "Foraging radius". (编) ed. A.R.E. Sinclair and M. Norton-Griffiths. Serengetti: Dynamics of an Ecosystem. Chicago: Univ. Chicago Press. 1979: 164–85. ISBN 0-226-76029-4. ^ Wing, L.D. & Buss, I.O. Elephants and Forests. Wildl. Mong. 1970, (19). ^ Owen-Smith, R.N. Megaherbivores: The influence of very large body size on ecology. Cambridge studies in ecology.. Cambridge: Cambridge Univ. Press. 1992. ISBN 0-521-42637-5. ^ MacFee, R.D.E. & Marx, P.A. Humans, hyperdisease and first-contact extinctions. (编) eds S. Goodman & B.D. Patterson. Natural Change and Human Impact in Madagascar. Washington D.C.: Smithsonian Press. 1997: 169–217. ISBN 1-56098-683-2. ^ MacFee, R.D.E. & Marx, P.A. Lightning Strikes Twice: Blitzkrieg, Hyperdisease, and Global Explanations of the Late Quaternary Catastrophic Extinctions. American Museum of Natural History. 1998. ^ Fiedel, S. Man's best friend: mammoth's worst enemy?. World Archaeology. 2005, 37: 11–35. ^ Lyons, K, Smith, F.A., Wagner, P.J., White, E.P., and Brown, J.,H. Was a 'hyperdisease' responsible for the late Pleistocene megafaunal extinction? (PDF). Ecology. 2004, 7: 859–68. （原始内容 (PDF)存档于2006-05-27）. ^ Whitney-Smith, E. Late Pleistocene extinctions through second-order predation. (编) eds C. M. Barton, G. A. Clark, D. R. Yesner. Settlement of the American Continents: A Multidisciplinary Approach to Human Biogeography. Tucson, AZ: University of Arizona Press. 2004. ISBN 0-8165-2323-1. ^ Whitney-Smith, E. Clovis and Extinctions – Overkill, Second Order Predation, Environmental Degradation in a Non-equilibrium Ecosystem "Clovis Age Continent". University of New Mexico Press. 2006. ^ Soffer, O. The Upper Paleolithic of the Central Russian Plain. Orlando, Florida: Academic Press. 1985. ISBN 0-12-654270-8. ^ Study links mammoth extinction, comets. USA Today. 2009-02-01 [2009-04-04]. ^ Evan Hadingham. The Extinction Debate. NOVA. [2009-04-04]. ^ Last Extinction. NOVA. 2009-03-31 [2009-04-04]. J.H. Brown (University of New Mexico). Was a hyperdisease responsible?